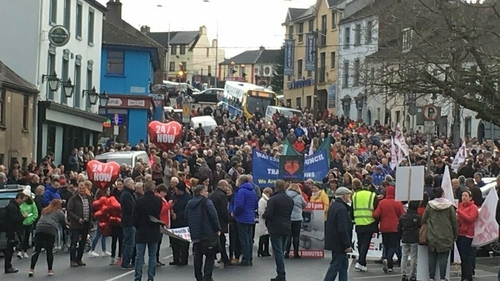 Several thousand protesters have taken to the streets of Waterford calling for the provision of round-the-clock cardiac services at University Hospital Waterford. The group 'Health Equality for the South East' co-ordinated the rally with other campaign groups to highlight what they describe as a "continuing and inadequate lack of cardiac care in the region". Protesters congregated at The Glen in Waterford city before marching on to John Robert Square during the demonstration, entitled 'South-East Broken Hearts'. At the rally, survivors of cardiac illnesses described their dissatisfaction at having to travel to Cork city - over 100km away - in some cases requiring urgent cardiac care. There were also calls for the opening of a second cardia catheterisation lab at University Hospital Waterford.